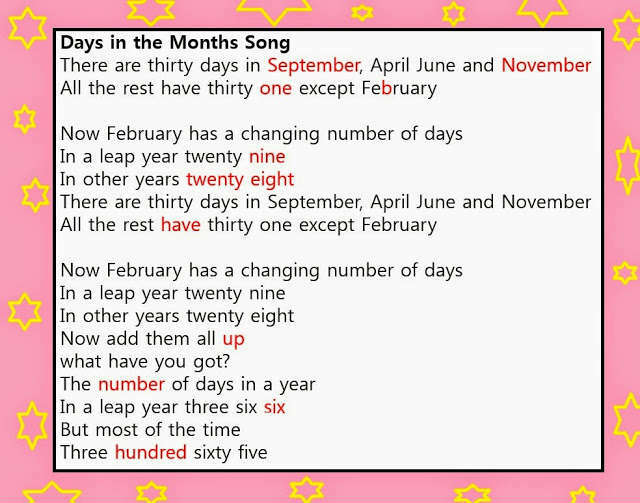 First, I found a song about our topic - a perfect song for any lesson about months and days is by 'Kids 123' which is called "Days of the Month Song" - which I found quickly on YouTube. You'll probably notice the mistakes quickly. So in class my students were handed a copy of the lyrics with errors each. I told them "You're mission is to find the mistakes and correct them! Make the changes!" Next, I played them the song twice only and rewarded the student who could find the most mistakes with a small gift from our treasure bin. There was one student who found 10 , shy of 1, but on average the students could find at least 6. I suggest doing this as a mid-way warm up during any unit, you can use any song that they know or don't know. I think, if your students know the song well enough - you could let them correct without listening first and only after play the song. It's a nice way to practice reading, spelling and listening. Total time : 5-6 minutes.